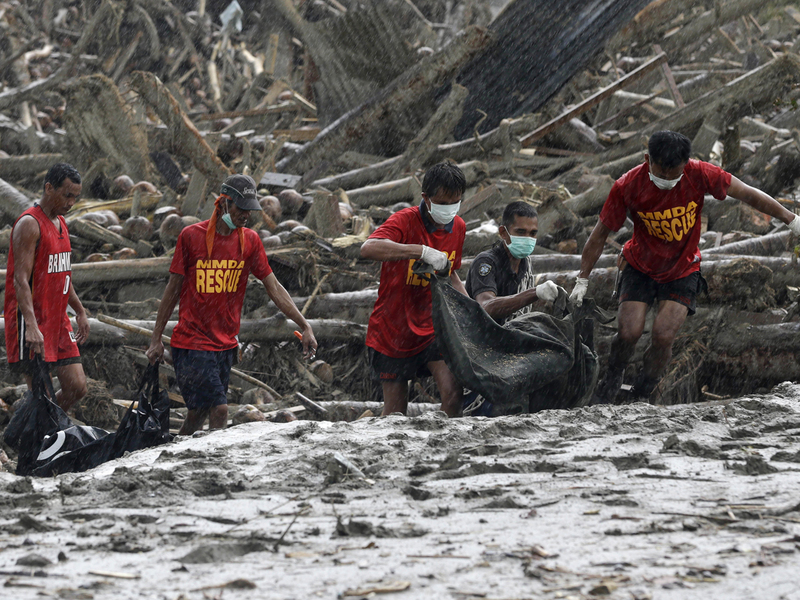 NEW BATAAN, Philippines Rescuers were digging through mud and debris Friday to retrieve more bodies strewn across a farming valley in the southern Philippines by a powerful typhoon. The death toll from the storm has surpassed 500, with more than 400 people missing. More than 310,000 people have lost their homes since Typhoon Bopha struck Tuesday and are crowded inside evacuation centers or staying with their relatives, relying on food and emergency supplies being rushed in by government agencies and aid groups. "I want to know how this tragedy happened and how to prevent a repeat," President Benigno Aquino III said during a visit to New Bataan town, the ground zero of the disaster, where ferocious winds and rains lashed the area. Officials have confirmed 252 dead in Compostela Valley, including New Bataan, and 216 in nearby Davao Oriental province. Nearly 40 others died elsewhere and more than 400 are still missing, about two-thirds in New Bataan alone. Aquino told New Bataan residents gathered in the middle of toppled coconut trees and roofless houses that he was bent on seeking answers in order to improve their conditions and minimize casualties when natural disasters occur. Fatal storms and typhoons blowing from the Pacific are common in the Philippines, but most of them hit northern and central areas, and southern Mindanao Island is usually spared. "We are going to look at what really happened. There are allegations of illegal mining, there are allegations of the force of nature," said Interior Secretary Mar Roxas, who traveled with Aquino. "We will find out why there are homes in these geohazard locations." The economic losses began to emerge Friday after export banana growers reported that 14,000 hectares (34,600 acres) of export banana plantations, equal to 18 percent of the total in Mindanao, were destroyed. The Philippines is the world's third-largest banana producer and exporter, supplying well-known brands such as Dole, Chiquita and Del Monte mainly to Japan and also to South Korea, China, New Zealand and the Middle East. Stephen Antig, executive director of the Pilipino Banana Growers and Exporters Association, said losses have been conservatively estimated at 12 billion pesos ($300 million), including 8 billion pesos ($200 million) in damaged fruits that had been ready for harvest, and the rest for the cost of rehabilitating farms, which will take about a year. Government geological hazard maps show that the farming town of New Bataan, population 45,000, was built in 1968 in an area classified as "highly susceptible to flooding and landslides." Most of the casualties were killed in the valley surrounded by steep hills and crisscrossed by rivers. Flooding was so widespread here that places people thought were safe, including two emergency shelters, became among the deadliest. On another part of Mindanao last December, 1,200 people died when a powerful storm overflowed rivers. Then and now, raging flash floods, logs and large rocks carried people to their deaths. The Bureau of Mines and Geosciences had issued warnings before the typhoon to people living in flood-prone areas, but in the Compostela Valley, nearly every area is flood-prone.